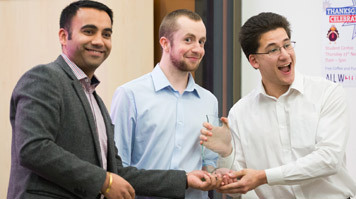 Student Enterprise at London South Bank University (LSBU) held the live finals of its Pitching Competition on 20 November 2014 at the LSBU Students' Union. The second round in the contest gave students and recent graduates the opportunity to pitch in front of a live audience and a judging panel of industry experts for £500 to turn their business ideas into a reality. Third year BEng Mechanical Engineering students Robert Finch and Leonardo Lee were awarded first prize for Green Machine, a community interest initiative that proposes to use the tops of LSBU buildings to grow fresh organic produce. They also plan to grow plants up the sides of buildings, making the university greener and reducing carbon emissions in the local area. "I had an idea involving the use of hydroponics for an assignment, but the idea wasn't carried through to the end. But the idea stuck in the back of my mind. It wasn't until I saw the advertisements for the pitching competition that I thought we could do something with it," says Robert. "The competition seemed like a good opportunity to test a few things out and also learn key skills. I was pretty nervous seeing the crowd build up, but it was a good experience to finally pitch and get feedback on the idea after working hard on it." The judges awarded second prize to Cephas Williams, a PGDip Architecture student who pitched Greeate Careers, a career-focused social enterprise for youths. The audience's choice award went to Green Machine and My French Farm, a French fine foods service by Victor Stagnoli, a MSc Business Project Management student, and Jacky Vincent, a third year BA (Hons) Marketing student. The judging panel included Hayley Philippault, Creative Director of Such and Such Design, and Chris Locke, founder of Start Up Republic, as well as keynote speaker Ben Wilding, Managing Director of web development agency Cameron & Wilding. "It was great to see all of the ideas that students are working on. There was a wonderful amount of variety from fashion and theatre to fitness and health. The support this university provides students will help put them in a great position for their future careers and businesses," comments Ben.